Today's ABC style challenge is G for Glitter and Glam. I can't help humming Glamorous as I type this post and feel grateful to Fergie for teaching me how to spell the word. 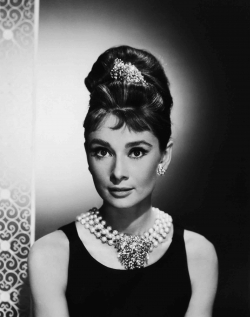 I also can't murmur the word glamorous without thinking of Audrey Hepburn. She is the epitome of glamor. I absolutely love this look from Breakfast at Tiffany's. 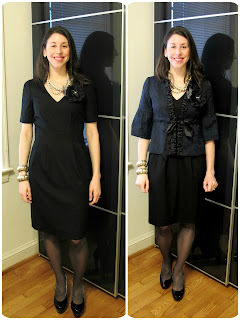 So, when I was thinking about an outfit for this challenge, I decided to pull my inspiration from my fashion idol of the forties, my grandmother, and Audrey. My inspiration for my earrings, necklace, and the pin (yep, the same feathery pin from yesterday's post) was taken from Audrey and my lip gloss and hair inspiration was taken from my grandmother. She definitely pulled it off better than I did. This is where I should mention that this past weekend I also purchased a curling iron to achieve goal number 17 on my 30 for 2012 list. Lots of people have told me how easy it is to use a curling iron, but I am curling iron challenged so I am going to keep practicing until I get it right. We're not quite there yet. Finally, I added a jacket to the outfit for the sole reason that my office is an ice box. I think it works though. Let me know what you think. Wonderful glam outfit. You look amazing.